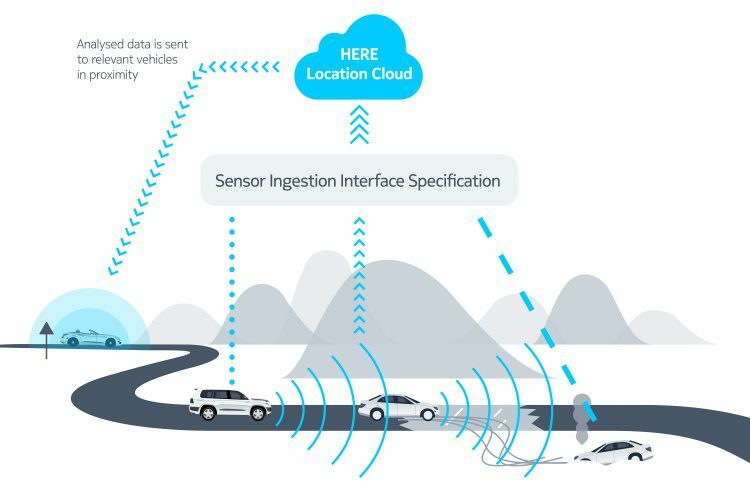 BERLIN, June 29, 2016—HERE, the location cloud company, today announced a significant step forward in efforts to drive a global standard for vehicle-to-cloud data – a development which in turn brings the promise of automated vehicles closer to reality. Following successful months-long discussions with international automotive and mapping companies in Europe, the U.S. and Asia, HERE has now submitted the design for a universal data format called SENSORIS to ERTICO – ITS Europe, the European public/private partnership for intelligent transport systems, which has agreed to continue as an Innovation Platform to evolve it into a standardized interface specification for use broadly across the automotive industry. To date, 11 major automotive and supplier companies have already joined the SENSORIS Innovation Platform now under the coordination of ERTICO. They are: AISIN AW, Robert Bosch, Continental, Daimler, Elektrobit, HARMAN, HERE, LG Electronics, NavInfo, PIONEER and TomTom. More organizations are expected to join in the coming weeks. HERE believes that pooling analogous vehicle data from millions of vehicles will be a key enabler for highly and fully automated driving, ensuring that each vehicle has a near real-time view of road conditions and hazards that can lead to better driving decisions. HERE is developing the required location cloud technology that can detect and process changes in the real world as they happen – including on roads in dozens of countries – on an industrial scale and at high quality. HERE is putting this infrastructure in place ahead of anticipated new streams of vehicle sensor data it will be processing in its location platform in future. “Standardized vehicle data exchange will enable the crowdsourcing paradigm to spread across the fragmented automotive ecosystem, leveraging the synergies between connectivity and sensor data to provide smart mobility services such as real-time traffic, weather and parking spaces in the short term while holding the promise to power self-driving cars with critical high accuracy real-time mapping capabilities in the future,” said Dominique Bonte, Managing Director and Vice President, B2B ABI Research. ERTICO – ITS Europe is a body which has a long track record of successfully overseeing the development of globally-adopted standards relating to future automotive and transportation technologies. This includes in particular ADASIS (Advanced Driver Assistance Systems Interface Specifications), a forum that defines how maps connect and interact with the advanced driver assistance systems of a car. ADASIS was originally borne out of technology patented by HERE in 1999 called ‘Electronic Horizon’, which enables a vehicle to, for example, adapt cruise control or be more fuel efficient based on road attributes included in a map, such as the slope and curvature of the road, traffic signs and lane information. To know more about the standard for how in-vehicle sensor data is transmitted to a location cloud, read our official blog, HERE 360.